September 26, 2011 By This post may contain affiliate links. These Edible Googly Eyes are the perfect addition to these Rice Krispies Treat Ghosts! 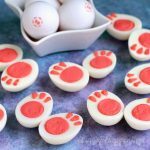 These simple spooky treats are fun to make and even more fun to eat! This cheery little ghost makes me smile, which is a good thing right now. Katya’s visit was wonderful but she returned to Russia this week and I have been rather blue. To make matters worse the weather has been so gray and dreary. Whenever the sun poked out from behind a cloud this week, I jumped up and ran outside to bask in all of it’s glory. All week I kept telling myself, “get back in the kitchen and get something made,” but I just had no enthusiasm, which is very unusual for me. I awoke yesterday to sunshine and jumped out of bed with renewed sense of joy, and made my way into the kitchen. I jotted down ideas for some new Halloween recipes, then got busy creating the one that I thought might just perk up my spirits. It worked. Over the summer I did a tutorial on making edible googly eyes out of gel capsules and edible black pearls which I attached to sea creatures made from modeling chocolate. I wanted to revisit that idea for Halloween and thought a googly eyed ghost would be perfect. 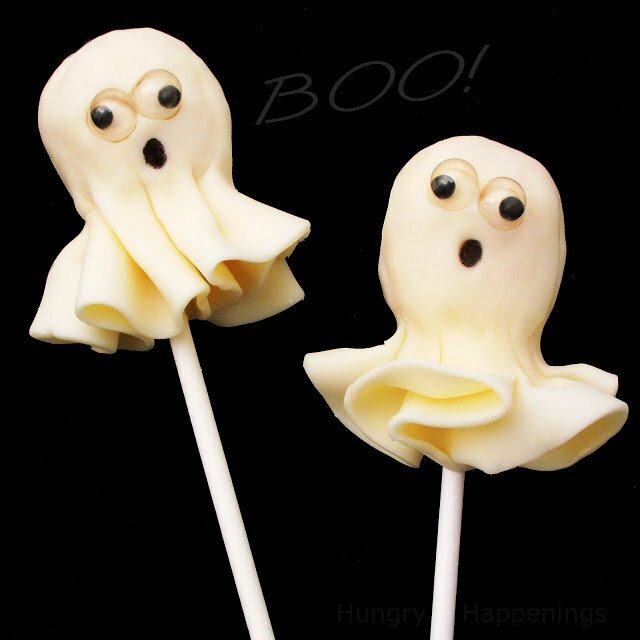 To make my ghost, I wanted a round head of some sort on which to drape my ghostly white modeling chocolate. The head would need to be soft enough to press the googly eyes into, but firm enough to hold a stick. 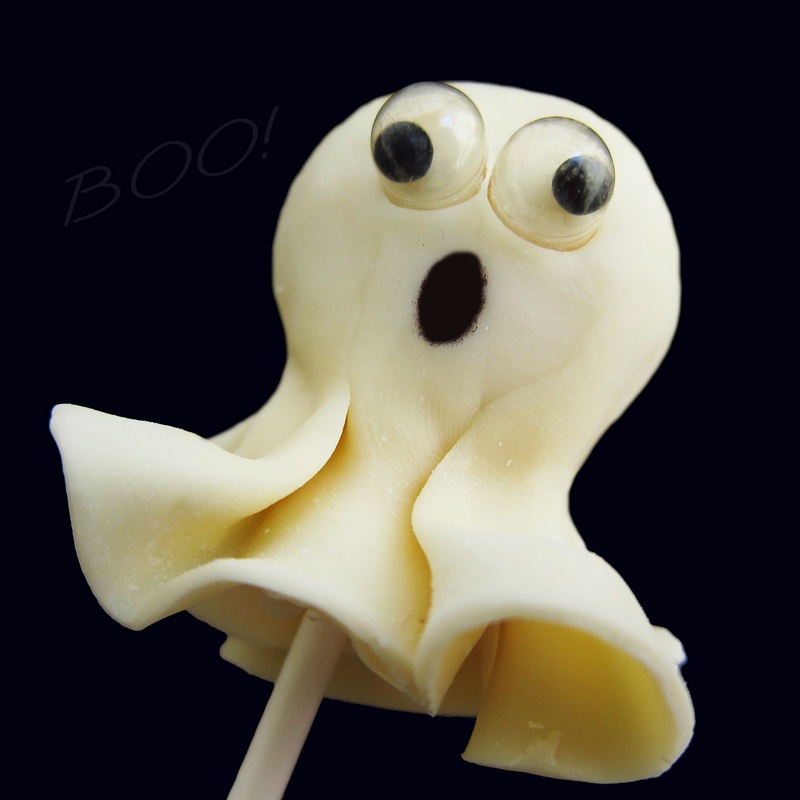 I tried peanut butter fudge balls, but the stick eventually popped out of the ghosts head – not good. I tried Oreo truffles, but the same happened. I could have dipped both of these or even cake balls into chocolate to coat them, but then I’d have to bother with cutting down my gel capsules to make the googly eyes. I really wanted to be able to use the small side of the gel capsules without cutting them. I was hoping I could just press the whole thing into the ghosts head. I finally found the solution was to make the heads using rice krispies treats. I rolled pieces of the treats into little balls, draped white modeling chocolate over them, pressed in two googly eyes, and added a mouth using edible ink. The resulting ghosts where just what I wanted, sweet (O.K. very sweet, but I never mind that) and adorable. These sweet ghosts would look great as cupcake toppers and would make a great addition to a graveyard cake, a scary forest cake, or a gingerbread haunted house, but they just as special as an individual little treat. 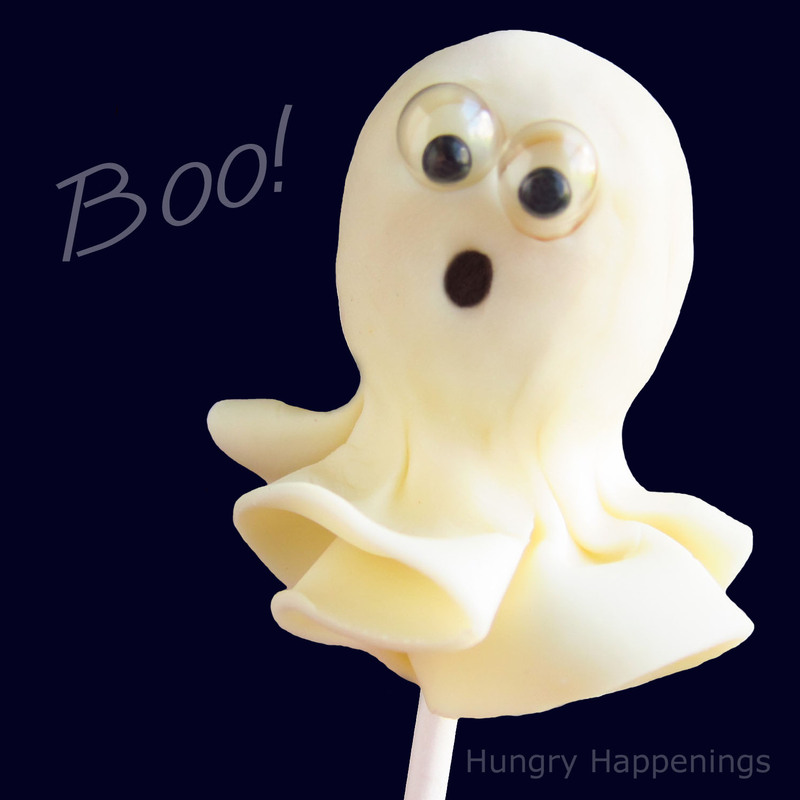 Rice krispies treat pops draped with white modeling chocolate and decorated with edible googly eyes. Caution: although the googly eyes are edible, they may pose a choking hazard for young children, so I recommend allowing the kids to have fun wiggling the eyes around then remove them before the kids eat the pops. Before you begin: You will need to make a batch of white modeling chocolate, using 16 ounces of white chocolate (or confectionery coating/candy melts) and 1/3+ cup light corn syrup. For the recipe and detailed step-by-step tutorial click here. To read more detailed information about making edible googly eyes click here. Cut each rice krispies treat in thirds width wise. Roll each piece of cereal treat into a ball. Insert a lollipop stick into each ball. After you have made your rice krispies treat pops, follow the instructions below to roll out the white modeling chocolate, cutting it into 4 1/2″ rounds. After you have cut a few rounds, proceed (if you cut all of the rounds at once, your modeling chocolate may dry out too much to easily drape over the pops.) Drape one round of modeling chocolate over each pop. I thought about leaving the draped modeling chocolate to hang loose, but decided that in order to keep the rice krispies treat fresher, it would be best to gather the modeling chocolate around the stick, pinching it together gently but still allowing a nice drape. They remind me of the ghosts I used to make out of white tissue paper wrapped around a Tootsie Pop when I was a kid. 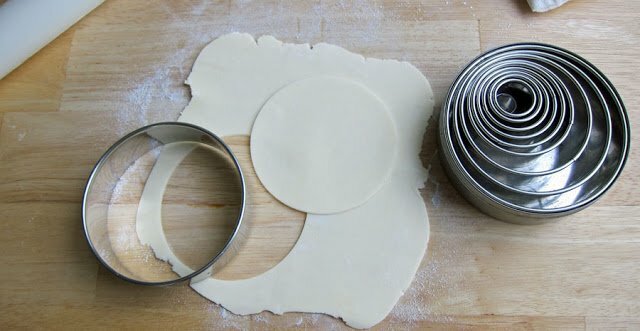 To make your modeling chocolate rounds: dust work surface lightly with powdered sugar. Roll out some white modeling chocolate to no more than 1/16th of an inch thick. Cut out circles using a 4 1/2″ round cookie cutter. To make the edible googly eyes: separate the gel caps. Use the smaller side of each cap for each eye saving the large side for another use or just dispose of them. Place one black edible pearl into a gel cap and press the gel cap into the face of a ghost, leaving enough room so that the black pearl can wiggle around. Repeat adding a second eye. 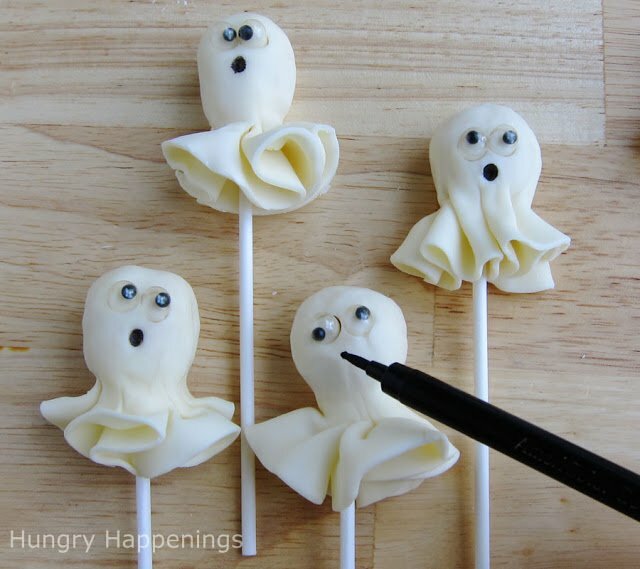 If you’d like mouths on the ghosts, use an edible black marker to draw on mouths. Wrap each googly eyed ghost in a clear cellophane bag to hand out as treats. 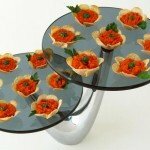 Keep stored in an airtight container for several weeks. 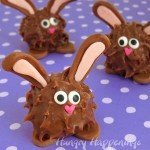 Alternative decorations: If you don’t want to add googly eyes, you could color some of the modeling chocolate to use for the eyes and mouths or use mini chocolate chips. That's a cute ghost! Love how to make the eyes! This so clever and adorable, I love it! Love the googly eyes, I've been trying to figure out a way to make them – and you've done it for me! Fantastic!! Sooo cute … the eyes are absolutely the best!!! 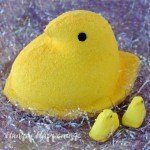 These are so adorable that I can hardly stand it! We live in Rome, Italy where Halloween isn't a big thing but since my daughter is two years old this year, we're having a little party and these ghosts are going to be involved. For sure. 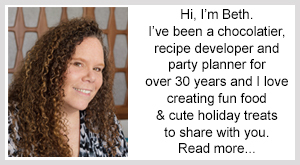 Love your site in general and just added it to my blogroll. Best to you and can't wait to see what you come up with next! Thanks everyone! I gave the pops I made to my neighbor's kids and they went nuts over them. These are so darn cool! Great job. And I love your googly eyes! CUTE!!! 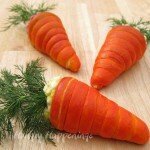 I am finding so many ideas from you, my daughter would adore these. Thanks everyone. I just love these little ghosts and am happy you do too! Just wanted to share, and thank you for sharing as well 🙂 The newspaper is updated every 24 hours, so if you don't see this until tomorrow or later, just check the archives for the 10/11 issue. Huge thanks Kim for the feature! So adorable! I love them! 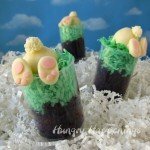 I host a linky party that runs through Friday each week (Crazy Sweet Tuesdays) and would love for you to join sometime! Those are so cute and the eyeballs OMG I love them! Thank you for sharing. Linked up Dorothy. Thanks for stopping by. These are so cute! My kids would just love them! I found you through the Itsy Bitsy Paper Halloween linky party. Thanks for sharing!